New York City Department of Environmental Protection (DEP) Commissioner Vincent Sapienza today joined with Brooklyn, Queens elected officials, community leaders, and environmental advocates to announce a $400 million plan to further improve the ecological health of Jamaica Bay. The plan includes an array of waterbody improvement projects including 50 acres of wetland restoration, seven acres of ribbed mussel installations, and environmental dredging, all of which will result in a healthier Jamaica Bay. The projects will also deliver economic, social and ancillary environmental benefits, including healthier air and lower summer temperatures due to the addition of a significant number of new trees and plants. The plan is being submitted to the New York State Department of Environmental Conservation today and if approved, planning and design could begin as soon as 2019. “We cannot overstate how a worthwhile investment in Jamaica Bay is to the returns we get as a city,” said State Senator Roxanne Persaud. “Restoring wetlands doesn't just help our residents during major storms, they protect us from coastal erosion, and make our waterways cleaner for the plants and animals in their habitat. I look forward to seeing results from this exciting DEP project." 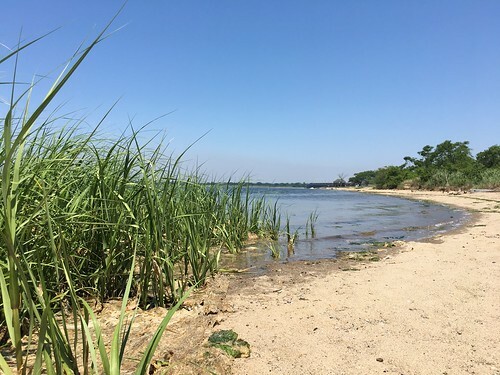 “DEP has been a great partner in the effort to improve water quality and enhance wildlife habitat in Jamaica Bay,” said Don Riepe, Director, NE Chapter, American Littoral Society. “Over the past several years they have supported the Littoral Society's Restoration Corp, a green jobs youth program working on saltmarsh restoration and shoreline cleanup of marine debris in Jamaica Bay. We fully support their Long Term Control Plan to increase funding for green infrastructure and living shorelines”. DEP has already invested more than $1.5 billion to improve the health of Jamaica Bay. This includes large underground tanks at Paerdegat Basin and Spring Creek to store any sewer overflow during rainstorms, the restoration of 137 acres of wetlands and 442 acres of maritime forests/grasslands through strategic partnerships and significant upgrades to the wastewater treatment plants that drain to the Bay, including reducing nitrogen levels. Ongoing is a massive $1.9 billion project to build a storm sewer system in southeast Queens as well as Green Infrastructure at schools and public housing as well as parks, playgrounds and curbsides. All of this work has already resulted in significant improvements to the water quality in Jamaica Bay. However, over the last 150-years New York City has lost approximately 85 percent of its historical wetland coverage, a significant amount of this within the Jamaica Bay watershed. These important natural areas serve as a protective transitional area between a body of water and dry land. Wetlands are extremely valuable as they help to absorb storm surge, filter impurities from the water, increase dissolved oxygen levels, reduce coastal erosion, capture greenhouse gases and serve as a productive ecological habitat and nursery for juvenile fish. Wetlands are among the most productive natural areas on earth and are particularly important in urban waters. In order to continue restoring these essential functions to Jamaica Bay, DEP is proposing significant investments in the restoration of wetlands and salt marshes. Ribbed mussels have also proven to be particularly effective at filtering impurities from the water and the plan calls for substantial installations in several of the Jamaica Bay tributaries. In addition, DEP will continue to expand the successful Green Infrastructure program to the communities surrounding the Bay. Jamaica Bay is a 31-square-mile water body with a broader watershed of approximately 142 square miles, including portions of Brooklyn, Queens, and Nassau County. It is a diverse ecological resource that supports multiple habitats, including open water, salt marshes, grasslands, coastal woodlands, maritime shrublands, and brackish and freshwater wetlands. These habitats support 91 fish species, 325 species of birds, and many reptile, amphibian, and small mammal species. In fact, Jamaica Bay is a protected United States Wildlife Refuge and is part of the larger Gateway National Recreation Area. DEP manages New York City’s water supply, providing more than 1 billion gallons of water each day to more than 9.6 million residents, including 8.6 million in New York City. The water is delivered from a watershed that extends more than 125 miles from the city, comprising 19 reservoirs and three controlled lakes. Approximately 7,000 miles of water mains, tunnels and aqueducts bring water to homes and businesses throughout the five boroughs, and 7,500 miles of sewer lines and 96 pump stations take wastewater to 14 in-city treatment plants. DEP has nearly 6,000 employees, including almost 1,000 in the upstate watershed. In addition, DEP has a robust capital program, with a planned $19.4 billion in investments over the next 10 years that will create up to 3,000 construction-related jobs per year. For more information, visit nyc.gov/dep, like us on Facebook, or follow us on Twitter.